San Francisco: Unless you’ve been living under a rock or hiding in a Pakistani cave, you know by now that gasoline will never again cost less than $2 a gallon and that hybrids are selling like hotcakes, for a niche market. You also know that the worst vehicles for fuel economy are big, heavy SUVs and ultra-high-performance sports cars. Enter the 2007 GMC Yukon. If you were a GMC engineer / designer and you had to come up with a new model that could make or break your brand you might redesign the Yukon with few hard angles and many organic shapes to make the new truck stand out and add a gas-saving feature to the 5.3-liter V8 that shuts down 4 cylinders while cruising on level surfaces, where not a lot of power is needed to keep the rig moving. Redesigning the Yukon must have been a difficult task indeed, since the styling of the previous model was new at least five years ago and there is so much stellar competition out there. What the stylists and designers delivered was handsome, taut lines with wraparound fascias front and rear and nary a plastic add-on in sight. The design team should be commended for putting a handsome and sleek SUV of this size on the road. One industry-wide accepted measure of build quality is the size of the gaps between the doors and the hood and fenders. We were quite impressed and a bit surprised with the small gap widths all around the Yukon. We kept marveling at the lengths the engineers must have gone to get those lines in line, so to speak. The new front fascia has a more refined look with a sloping grill and integrated bumper that looks like it is all one piece, because it is. This huge difference compared to the old vehicle is like night and day. The new truck looks like it was made from one piece of metal and plastic that belies its frugal price, at least in the vehicle we drove. General been able to put a seat out that was this comfortable and supportive. After a few days driving the Gray Dane around, we decided to head out to wine country; so the tank was topped off and we noticed we got 19 miles per gallon in mixed driving. Considering the shear heft of the Yukon, that ain’t half bad. We also like watching the display switch from V8 to V4 and back as we drove around. And remember, don’t try this at home, we are trained professionals (or so we like to think). Driving through rolling hills and reducing radius curves show that the Yukon has come a long way since the beginning of the SUV craze. It’s no GTO or Saturn Sky, but the Yukon gets going pretty good and there’s not a trace of wallow or too much body roll-like SUVs of old. Switchgear is top-notch. 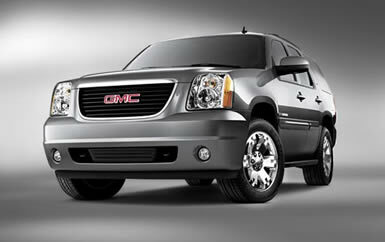 All have a soft, tactile feel and soft detents that give this base-model truck a classy, luxurious feel. One really neat feature is the lighted visible detent on the climate controls. During the day it is a mild-mannered dark spot on the bright chrome-like dial, telling you where your blower and output is set at. By night, it is a cool blue showman, ready for the next gig and willing to give it all for a great performance. One gripe we have about SUVs in general that this Yukon was without was a third row of seats. There are certain vehicles, like the Yukon XL and Suburban, that can do with the extra seating capacity without infringing too much on cargo space. Our tester did without this “convenience” and we were much appreciative to have the space to haul whatever we wanted without worrying about where to store those extra seats. Our two-wheel-drive Yukon tester stickered at $34.690, including $875 for delivery, with no chargeable options. Included on the standard feature list was the 5.3-liter V8 with Active Fuel Management (cylinder deactivation) and flex-fuel capability, four-speed automatic transmission, dual front airbags with passenger sensor, OnStar, Stabilitrak stability control / four-wheel ABS, remote keyless entry, 17-inch aluminum wheels, power heated outside mirrors, AM/FM/CD/MP3 radio, auto dimming mirror with temperature and compass and driver information center, to name just a few.